Growth In Incomes, Spending Slowed In 2012; Jobless Claims Jumped Last Week : The Two-Way The year ended on a strong note, with personal incomes up 2.6 percent in December alone. But over all of 2012, growth in both incomes and spending was less than the increases in 2011. The week's big economic news comes Friday when we'll hear how many jobs were created in January. Consumer spending rose in 2012, but not by as much as the year before. In December, these shoppers were out and about in Glendale, Calif.
Americans' personal incomes grew by 3.5 percent in 2012, compared with 5.1 percent growth the year before, the Bureau of Economic Analysis reports. 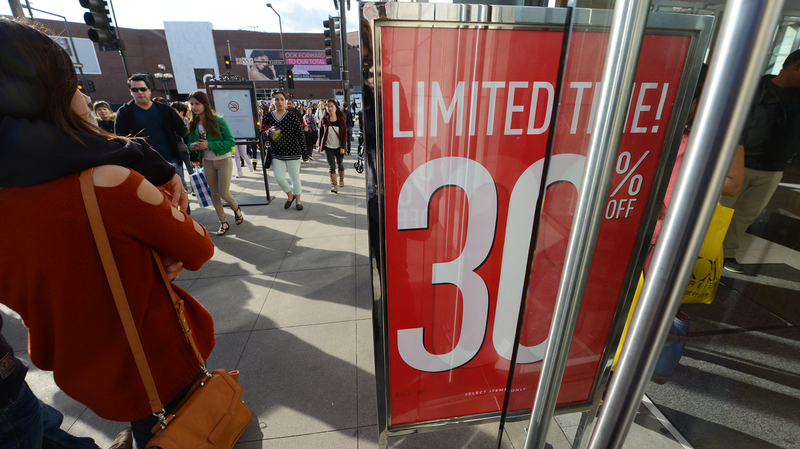 And it says consumer spending rose 3.6 percent last year, vs. 5 percent in 2011. But the year ended on one strong note: in December alone, incomes rose 2.6 percent from the month before. That's the biggest one-month rise in eight years, The Wall Street Journal says. Consumer spending was up 0.2 percent in December from November. Also this morning, the Employment and Training Administration reported that there were 368,000 first-time claims for unemployment benefits last week. That's up 38,000 from the week before. The increase is from a five-year low and puts claims back at "levels consistent with modest job growth," Reuters writes. The week's big economic indicator is due Friday at 8:30 a.m. ET. That's when the Bureau of Labor Statistics will issue its figures on job growth and unemployment in January. According to Bloomberg News, economists expect to hear that there were 165,000 jobs added to payrolls (vs. 155,000 in December) and that the unemployment rate remained unchanged at 7.8 percent.